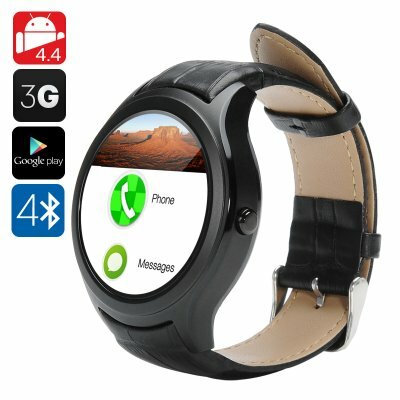 Successfully Added NO.1 D5 Android Smart Watch - Wi-Fi, 3G SIM, BT4.0, Google Play, GPS, Heart Rate, Pedometer, Barometer (Black) to your Shopping Cart. The NO.1 D5 Smart Watch has a sleek metal alloy body paired with a classy leather wristband brining suave sophistication to the smart watch market. Its circular design and feature rich functionality make it a real contender for 2016 smart watches. The screen of the watch brings 360x360 resolutions that display the Android 4.4 OS and all your favorite apps in a familiar, easy to navigate layout. It’s relatively slim for a smart watch and its inconspicuous deign belies its powerful performance while ensuring its never out of place whatever the occasion, be it a dinner party or work out at the gym. With 3G support the D5 cell phone watch has access to data so by inserting a supported SIM card you can enjoy updates from your social media apps and also access online data. The MediaTek Chipset also offers Bluetooth and Wi-Fi support so you can connect your home Wi-Fi network or sync the watch with you Smartphone for a host of paired functions. GPS support beings easy navigation options and interaction through the OK Google functions of Android make navigating the apps and functions a real pleasure. With heart rate sensor and pedometer the NO.1 D5 has a host of support for your workout sessions and will help you burn of the calories and keep trim. Equipped with a rechargeable 450mAh battery you can enjoy a day’s worth of fun and entertainment with the NO.1 D5, so making calls, monitoring your fitness and brining you directions will simplify life and make every day more enjoyable. The NO.1 D5 Smart Phone Watch comes with a 12 months warranty. Brought to you by the leader in electronic devices as well as wholesale phone watches..